To successfully talk about this book, I'd first have to discuss the very annoying and very hypocritical main character. The worst part is, Piper didn't even see how terrible she was until the very end of the book - to be honest, that's the part that saved it. From the very beginning, it was obvious that Piper had no clue what she was getting into. The problem was, no one could be as clueless as she was, and it bothered me. She kept going on and on about how much she hated the popular clique and how unfair it was that they got away with things they shouldn't. It was understandable at first: everyone's blinded in the heat of the moment. Unfortunately, Piper simply did not understand that justice wasn't hers to dole out. Almost everyone in this book had secrets, everyone except the love interest, Nick. He was quite perfect. He didn't jump to conclusions, he was unbelievably lovable, he had regrets, and absolutely no secrets. Hard to believe, but hey, he was a rarity in the book. Of course, it was difficult to believe that the popular jock started to fall for Piper for absolutely no reason, but I didn't dwell on it too much. He was another aspect of the novel that aided rather than hindered it. Nick didn't really have much of a purpose in the storyline, but he did help Piper realize how completely loco she was, and in my eyes, that is HUGE. Piper never would have come to her senses without him. When I first started reading this, I was almost sure that this was a horror/mystery type of book. Looking back, I have no idea why I thought this, but it did come as a disappointment to me that it wasn't. Even so, after a while, it did start to get better. Even if there was nothing else to the book, the brilliant "punishments" handed out to the "bad kids" was one of the things that kept me reading. Of course, what Piper failed to realize is that people are more than their bad parts - there's a reason behind who and what they are. This is why it was so painful, if intriguing, to see Piper and her partner ruin their lives, especially after the whole truth about each person came out. I found it terrible of her to so easily throw people under the bus, but find it fair to withhold her friends' secrets, even though they were just as bad, if not worse than everyone else's "crimes". Gone Too Far actually reminds me of a much less scary version of the new Unfriended movie coming out. But not as good, judging by the trailer. I honestly don't think that I would recommend this novel to anyone. While it had what sounded like an interesting plot, in reality, it wasn't as great as I had expected it to be. This is one of those times the love interest wasn't necessary, and what I had thought was a mystery turned out to be a ploy simply to teach the main character that there was more to a person than what/who he was at school. Maybe I would have enjoyed the story more if there had been a less obvious moral to it, but it's too bad it didn't. 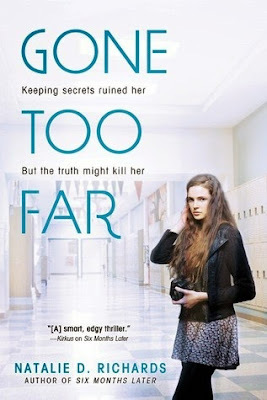 Book Synopsis: Keeping secrets ruined her life. But the truth might just kill her.